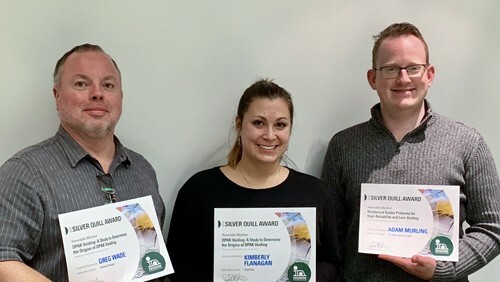 Silver Quill Honorable mention awardees, from left, Greg Wade, Technical Support Engineer, Global Accounts; Kimberly Flanagan, Technical Support Engineer, USA; and Adam Murling, Technical Support Engineer, Global Accounts. Indium Corporation has acknowledged several of its employees with the annual Silver Quill Award. Indium Corporation’s Silver Quill Award program recognizes individuals who have authored original technical content in the form of conference papers, articles, presentations, and blog posts. It was designed to reward employees for generating leading-edge research and thought-leadership technical content that addresses issues concerning customers in the electronics industry. The Silver Quill Paper of the Year, Impact on Stencil Quality on Solder Paste Printing Performance, was co-authored by Jeffrey Len, Technical Support Engineer, Malaysia; Leon Rao, Senior Technical Support Engineer, Eastern China; Evan Yin, Assistant Manager – Process Development Lab, Suzhou, China; and Wisdom Qu, Area Tech Manager, Eastern China. The paper was first published at the South East Asia Technical Conference on Electronics Assembly in Kuala Lumpur, Malaysia, May 2018. The paper examines how stencil quality impacts the screen printing process amid ongoing packaging and board-level assembly miniaturization trends. D-PAK Voiding: A Study to Determine the Origins of D-PAK Voiding by Kimberly Flanagan, Technical Support Engineer, USA, and Greg Wade, Technical Support Engineer, Global Accounts. The paper examines why a D-PAK exhibits more voiding than other types of bottom termination components. It also looks at the physics behind D-PAK voiding to provide more insight on how to remedy the phenomenon. The paper was first published at IPC APEX Expo 2018, February 2018, in San Jose, California, USA. Reinforced Solder Preforms for High-Reliability and Low Voiding was authored by Tim Jensen, Senior Product Manager for Engineered Solder Materials (ESM); Sunny Neoh, Assistant Product Manager for ESM in Asia; and Adam Murling, Technical Support Engineer, Global Accounts. The paper examines the challenges of high power applications on solder joints, and identifies how reinforced solder preforms can address these issues. First published at SMTA PanPac , January 2018, in Kauai, Hawaii, USA.